Financing low-carbon and climate resilient global food systems will require a paradigm shift in financiers’ investment decision-making processes. At the Food Systems Finance Advantage event, part of the larger Agriculture Advantage 2.0 event series at COP24, public and private industry leaders in the agriculture, forestry and land-use finance space gathered to discuss financial pathways to transform global food systems. Moderated by Alberto Millan, Senior Climate Finance Specialist for the CGIAR Research Program on Climate Change, Agriculture and Food Security (CCAFS), the session addressed the need to make public support climate-smart and the importance of mobilizing private investment and creating an enabling environment. Since 2000, there has been an increase in public support spending—over $600 billion is given in agricultural subsidies per year. However, as Martien van Nieuwkoop, Director of Agriculture Global Practice at the World Bank, highlighted, while 52% of this amount is spent on market price support, only 16% of it is spent on public goods, and of that, a meagre 1% on the environment. Moreover, agricultural subsidies often result in negative impacts, worsening, rather than improving, climate outcomes and market price support increases the vulnerability of farmers. He argued we need changes in the way public support is allocated in order to unlock the potential for positive public-good outcomes. It needs to be climate-smart. This could be achieved via providing incentives for farmers and redirecting support towards investment and innovation. This, however, is not sufficient to bridge the major gap in financing for food systems transformation. We also need creative ways to mobilize resources from the private sector in order to realize impact at scale. “The private sector can really drive change” argued Bernhard Stormyr, Head of Sustainability Management at Yara International. Agricultural activities cause greenhouse gas emissions and can result in land degradation, but the environmental cost is often externalised. This is a failure of the market. So one of the key challenges is to better incorporate externalities into the value chains. Therefore, Yara International with the World Business Council for Sustainable Development (WBCSD), initiated a research project with Oxford University to review data on the impact of internalising externalities. Marc Sadler, Practice Manager of Climate Funds Management at the World Bank, proposed increased use of the ‘jurisdiction approach’. He argued it could be useful for the government and also the private sector to follow activities and behaviour within a particular zone. This could help them move beyond traditional problems with trying to manage singular supply chains, and enable them to monitor behaviours and impacts. One of the issues in financing is that financial services are reluctant to invest in agriculture, let alone climate-smart agriculture (CSA). To promote investment, we need good quality business cases and an enabling environment”. There will be no transformation without support to vulnerable groups, such as smallholder farmers. Andre de Jager, Managing Director at SNV noted that many smallholders already have a clear plan for what they want to achieve on their farms, but they struggle to find investors. SNV has focused on inclusive business, and have been working with small and medium enterprises to help them increase productivity and adapt to climate change. But while the existence of pilots is reassuring, we need to upscale and transform the private sector involvement. To achieve this, we urgently need to create an enabling environment. Margarita Astralaga, Director of the Environment, Climate, Gender and Social Inclusion Division at the International Fund for Agricultural Development (IFAD), also agreed that we need “clear rules of the game for everybody”. Since 2012, IFAD has been working in collaboration with CCAFS on the Adaptation for Smallholder Agriculture Programme (ASAP). The goal of the program is to provide grants and loans that aim to tackle climate-related risks that smallholders face. The program found that providing grants to higher-risk investments encouraged private sector to invest in agriculture. 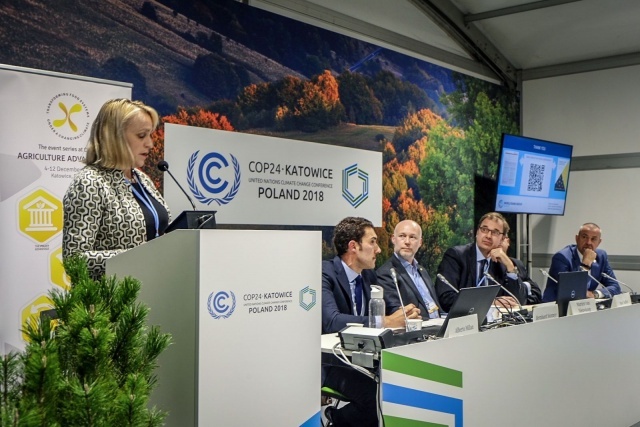 While billions have been spent on climate finance, only a small proportion of it was focused on the agricultural sector, explained Angela Falconer, Associate Director at the Climate Policy Initiative (CPI). She explained ways climate finance could align with the needs of the agricultural sector. Supporting microfinance institutions at local levels is one such way, and can help small enterprises grow. CPI’s Global Innovation Lab provides support to smallholders by giving them access to grants and expertise. IFAD has recently partnered with CPI’s Global Innovation Lab in order to find and invest in new instruments to get the money to the right people and to investigate how to guarantee prices for the produce of smallholder farmers. Action by the financial sector is crucial to finding solutions for scaling up climate-smart practices and enabling a sustainable global food system. But significant changes, such as realigning the direction of money flows, are necessary across the sector to reach those goals. Couldn’t attend the event? Watch the web recording here (click “Join the event” to watch).